Home » How Synthetic Opal Can Make Your Jewelry Magnificent? How Synthetic Opal Can Make Your Jewelry Magnificent? Real opal is something very appealing and beautiful to all and if you are looking for something brilliant and very unique you should look at most wonderful synthetic opal that is worth buying. These are actually a natural occurring stones that looks like most of the gemstones. As naturally occurring opals are rare and hard to find, there are now an alternate to these which are known as synthetic opals. These are actually the man made copy of natural opals that are less expensive and are easy to get. Synthetic opals are also marvelous pieces of opals unlike the natural ones. These are man made and are manufactured under very strict supervision and conditions. As there is high demand of most special and expensive gemstones in our society more and more people are also getting attracted towards these special synthetic opals. 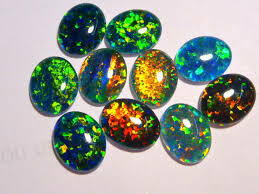 And for this very reason there is wide range of jewelry now available that are made of synthetic opal. Natural and synthetic opals look quite attractive and do not show much difference when looked with common eye. These both types of opals have regular basic pattern and are highly priced. Available in various stunning and bright colors these attractive opals are durable and long lasting due to its hardness. These are quite appealing to every eye and everyone wants to have them when noticed at first sight. In all synthetic opal is one of the most fabulous options for you when you want to get some magnificent jewelry items that look unique and stunning. These are good alternate to natural opals due to its wide range of benefits together with high resistance and excellent durability. So why not, Look at these stunning gems and you could make yourself look cool at every occasion when you are with these synthetic opals. Previous: What Do Your Men’s Pendants Say About You?